Electric Motor is the best option to run the Air Compressor in any engineering unit. Air compressor is the utility which consumes maximum electric power in any plant. Air compressor can be driven by the DG Set also, but it is very expensive option comparing to driven by electric motor. Maximum plants used an electrically driven air compressor for compressed air purpose. If you have no knowledge about electrical then it will be very difficult to run air compressor sometimes. You will get the information on an electric motor from this post, which contains general information about the electrical used with the air compressor. Induction Motor, Squirrel cage or wound rotor (Slip ring) type, of various ratings & suitable motor starting gears, are employed according to the capacity of the Air Compressor. These may be of Low Voltage (LV) or High Voltage (HV) grade, depending upon the requirement. It is most important to install the electric motor with proper check-ups. If your electric motor installed properly, then you rest assured that you will get the maximum performance and trouble-free operation. 01) Check Name Plate details of electric motor & Starter, both the specification should match each other. It is most important to match Rotor Volts (RV) and Rotor Amps (RA) of Slip ring Motor. 02) Inspect for any transit damages. If found any damage, report the nature of damage to the nearest office of compressor manufacturer if purchased with Air Compressor or Motor manufacturer if purchased separately. The delay in reporting the matter would involve considerable problems to claim the damages from insurance authorities or the concerned equipment manufacturers. 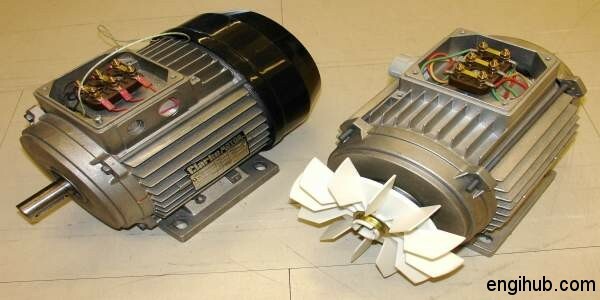 03) Prior to installation, the motor should be stored in a clean, dry place. The motor parts have a protective coat of anti-rust preservative which should not be removed during the normal storage period. In the case of long storage, periodic examinations should be carried out and fresh preservative applied if required after any rust or moisture has been removed. 04) Before putting the electric motor into operation, measure the insulation resistance between the motor winding & frame with Meager 500 volt meager is required for low voltage motor. The insulation resistance must above 2 megaohms if found below the value, Dried Out the motor immediately. Insulation resistance of Starter should not be less than 20 mega-ohms. 05) If a motor is stored for more than 8 months period, then before starting the electric motor, the bearing cover should be removed and the grease in the bearing cover should be pressed with thumbs between the races of the bearings. If any deterioration of grease is apparent, the old grease should be removed and new grease pressed into the bearings & housing.